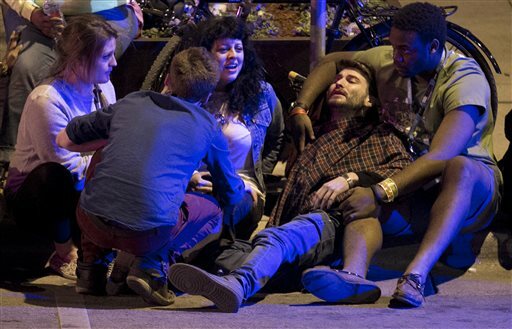 A car plowed through barricades near SXSW in Austin, Texas outside of The Mohawk, killing two people and injuring 23 others. Five of the injured are critically injured, the Austin Police Department said. The driver, who was being pursued by police officers when he crashed through the temporary barricades, was taken into custody. The suspect is a black male. Austin Police Chief Art Acevdeo said that the suspect was tased when he was apprehended. The suspect will be charged with two counts of capital murder and 23 counts of aggravated assault. Acevedo said that the situation started when when a unit monitoring people driving under the influence made a traffic stop at a Shell gas station. The driver sped off going the wrong way down a street before plunging into the crowd. The Mohawk was set to host several shows on Wednesday evening, including from Tyler the Creator. People were waiting in line to see the show when they were hit. Graphic photos shared on Twitter and Instagram show bodies on the ground and people dispersed around the scene, as well as emergency responders. Bystanders were shocked over what happened. “Walked out of Mohawk at 12.30 a.m. to discover chaos on Red River Rd – people bleeding, people helping their friends, crying,” said Simon Collins, music editor of The West Australian, via Twitter. The police have told people to leave the scene as it’s now being treated as a crime scene, one eyewitness said via Twitter. The South by Southwest, or SXSW, is a music festival that’s been going on in Austin all week. People at the festival or those with friends of family at the festival took to social media websites to try to get a hold of them to make sure that they were not one of the ones hit by the vehicle.